From Tuesday, September 15 you can visit the new eight rooms of the Gallery (numbers 25-32), with a new permanent setup dedicated to the second part of Quattrocento (the fifteenth century). The rooms form a \"U\" path, which begins and ends in the third Corridor. So they are in the oldest part of the Uffizi palace, the one closest to the Arno, where they were originally the Arsenal and the Foundry. The rooms are characterized by the original skylights in the center of the ceiling, and by the new green walls. The color is inspired by the works of the displayed artists: Alessio Baldovinetti, Domenico Ghirlandaio, Cosimo Rosselli, Pietro Perugino, Filippino Lippi, Lorenzo di Credi, Luca Signorelli. Great artists of the fifteenth century, so far overshadowed by the proximity of the \"greatest ones\", now have a space for themselves, unrelated to the most famous works that attract the most tourists and prevent many art lovers from also enjoy these magnificent masterpieces. The intervention, which is not one of the works for the New Uffizi, was realized with funding from the Salvatore Ferragamo SpA. It allowed to exhibit even 42 paintings and a sculpture until now unfairly hidden from the public, that arrive from the Galleria deposits. The part included in the work had already had an operation two decades ago: it is located near the entrance to the Vasari Corridor, and was damaged by the bomb in Via dei Georgofili. The rooms are now equipped with new air conditioning systems and security, as well as with a renovated paving. The Uffizi path is further enriched: the great artists before partly sacrificed will now have the visibility that is theirs by right. 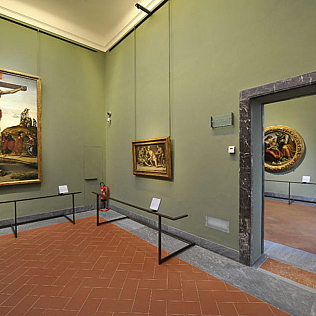 And visitors interested in a careful examination of the works in their uniqueness but also in the proper context in which they were born, will now have the opportunity to move into new areas, different from those of the great symbols of the Uffizi, often surrounded by the crowd.